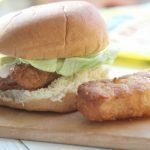 Crispy Fish Slider Sandwiches with Cayenne Ranch Sauce are perfect for lunch or dinner. These are easy to make and the whole family will love them! Bake fish fillets according to the package instructions. While the fish are baking you can make the cayenne ranch sauce. In a bowl mix the ranch dressing, hot sauce, cayenne pepper and chili powder together until well combined. Store leftover cayenne ranch sauce in a jar in the refrigerator. Remove fish from the oven when they are done cooking. Place one fish fillet on each slider bun. Top with lettuce and cayenne ranch sauce. ENJOY!